I am looking forward to the LBDC | Lawyers’ Business Development Club | returning to Dubai. We will have an exclusive networking event for the Club on Tuesday 26 April. It would be great to see you if you will be in Dubai then. If you have any lawyer friends/colleagues in Dubai that you think may be interested in joining us, please feel free to pass them the details below. I hope to see you if not in Dubai at one of our future LBDC events in London, Dublin, New York, Boston or San Francisco! We are also planning to launch the LBDC in Geneva and Paris later this year, so please stay tuned for more details! We will be celebrating our 50th LBDC Talk in London on Tuesday 19 April 2016, 6.00 to 8.00 PM. If you were free then, it would be great to see you. 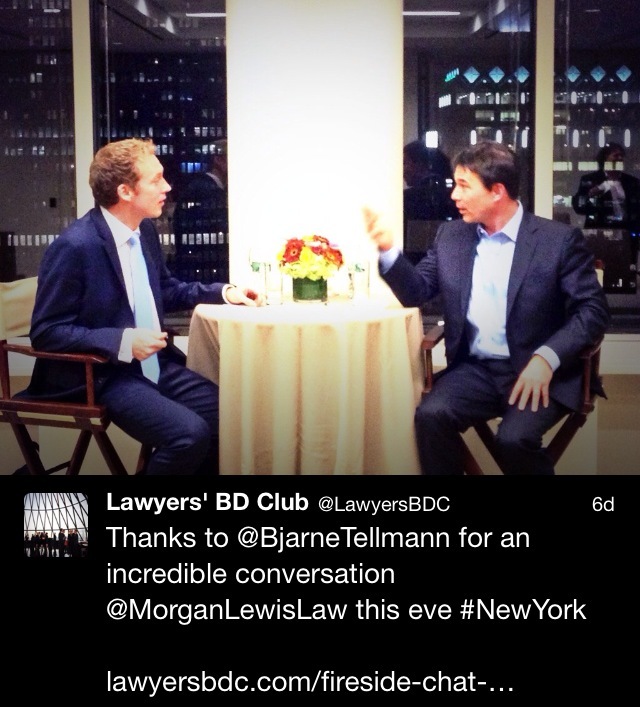 As some of you may know last October, we had a wonderful fireside chat in New York with Bjarne P. Tellmann (sponsored and hosted by Morgan Lewis). So, I am looking forward to another very enjoyable evening in London.